Shane and Amy Riley of Oreana, Idaho. Shane and Amy Riley are the friendly faces behind J Bar D Canvas and Leather, an amazing, creative small business. 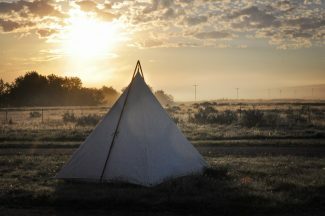 They built us a beautiful, perfectly-crafted tipi that comfortably fits our family of four. 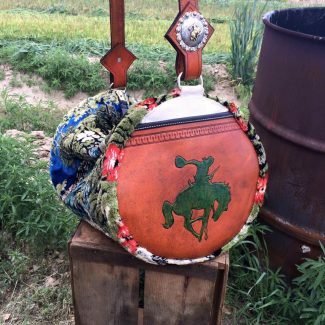 They are known mostly for their tipis and bedrolls, but have been expanding their repertoire to include amazing leather work, some is even hand-painted, and the finest canvas creations money can buy. J-D is a huge supporter of Western States Ranch Rodeo Association and the buckaroo lifestyle. They are such good-hearted people to boot. There are no strangers with Shane and Amy, and they have a lot of fun on their Facebook page and on Instagram @JBarDCanvasandLeather! You can also visit their website www.jbardcanvasandleather.com. Our little business just sort of snuck up on us. We, in no way, thought we wanted to have a Facebook-type fledgling business in our middle years. It was fall of the year in 2014, we had just weaned calves and worked cows when the neighbor (my former boss) had spotted a dozen pairs on the wrong side of the mountain. I rode over the top and my two new bosses went low. We had a plan to push anything we came up with to a loading corral four miles over in another drainage. About mid-morning, I gathered five to six pairs and headed them downcreek. I was riding a younger horse I called Judge. The lead cow crossed the creek at a bad spot. I got off to shove a limb out of our way and cross under the willows. When I stepped over the little creek, Judge came full bore, trying to clear the willow patch. He came down on my right ankle. I can’t remember going down but the shock put me out. I came around looking straight up at my cinch shoofly. I still praise Judge for not running off. My macate was still in my hand. I got up hill from him and climbed on like a chubby kid on a Shetland. We got around the lead and corralled the pairs, but every step reminded me why I loved to buckaroo. It was romantic, sunlit pain. Or so they say. Looking at two months on crutches. I asked Amy if she wanted to build a bed-tarp. Mine had burned in a fire a couple years back and I was using a canvas bean sack. Money was a tiny bit tight, so I traded a bit off for $130. That’s the capital J-D started with. Amy sewed up a chunk off canvas and I put leather straps on it. When it was done she said, “I think we could sell this.” We put it on a trading site on Facebook and it sold in eleven minutes. We drove to town three days in a row buying more canvas before we realized we could buy enough for three bed-tarps at a time instead of just one. Real business sense right there! Now, we have made well over a thousand bed-tarps, 87 tipis, and over a thousand warbags since those crutches days. In the short time we have operated J-D, we have met the best people in the world. We have had the privilege to make gear for world champion cowboys; Australian, Italian, and Canadian cowboys; ivy league horsewomen; cow bosses still pulling a wagon crew out; grandparents of future generation stockmen; and even a buckaroo or two. 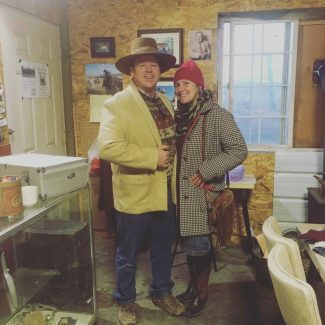 I spent a lot of time buckarooin’ on low wages and use that to keep in mind a business goal: make our gear affordable for a working cowboy. We enjoy what we do. This is a continuation of Buckaroo Buys, posts that feature my personal favorite makers and artisans. I am not paid or reimbursed to recommend these products and makers. This is a lifestyle and commitment for these makers and they rely on you. I hope you will check out their gear and maybe send some business their way if you see something you like. Be sure to tell them Savanna and Cavvy Savvy sent ya!